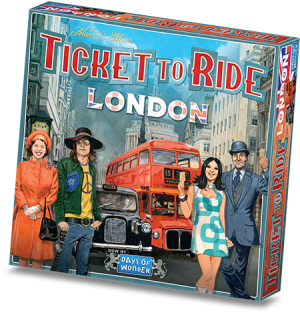 This entry was posted on Tuesday, April 2nd, 2019 at 14:59 and is filed under Games, News, Ticket to Ride. You can follow any responses to this entry through the RSS 2.0 feed. Both comments and pings are currently closed. BUT – and I’m sure you’ll get a lot of complaints: it’s not “SAINT PAUL”; it should be “ST PAUL’S”. Also, The Charterhouse is a strange choice for a well-known location in London. I know Charterhouse Square from my cycle courier days, but I would have gone with something like Farringdon (Station), Smithfield Market or, most probably, Barbican. And it being set in the 1970s, you wouldn’t have been able to go the Globe Theatre. You could probably have stood near the site of it, but the current reconstruction of Shakespeare’s Globe was only opened in the 1990s. The final version (the one printed) have “St Paul’s” on it. For some reasons our assets included an old version of the board. 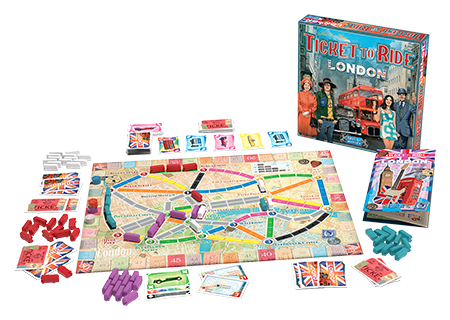 Wait, you’re doing a Ticket to Ride game about London and it’s NOT going to be the Tube/London Underground? The oldest and probably most famous city train system in the world, and you’re going with the buses? On your boardgame series that is famously about making train networks? YAYYYYYY so looking forward to this!!!!! Who cares about all the little details. Lighten up and just enjoy. Their game their choice. Don’t like it make your own. Can’t please everyone.